Nothing says summer quite so much as the aroma of a ripe peach. From that first bite, you’re transported to another place. A fuzzy outer covering hides sweet, juicy flesh, that usually comes in white or yellow. Bananas are also sweet, but with a much more delicate flavor. 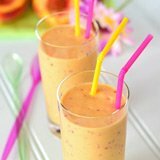 Combine the two in a banana peach smoothie and you have a sweet, creamy concoction that is healthy and not too overpoweringly sweet. Peaches with a deep yellow color are more acidic, but the flavor becomes more intense and sweeter as the fruit ripens and softens. The white varieties have a slightly less intense flavor, but are sweeter. It doesn’t really matter which variety you use for smoothies. 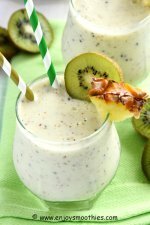 Bananas are the perfect addition to any smoothie. Not only do they add a delicate touch of sweetness but they make the perfect base. 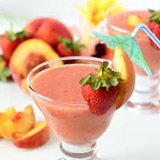 In fact both of these fruits add a creamy touch to smoothies, so you know these drinks are going to be thick and velvety. 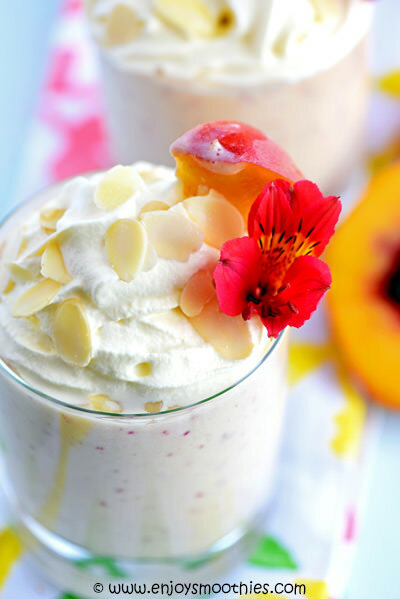 Peaches contain an impressive array of vitamins and minerals. They may not all be in large quantities, but boasting ten different kinds of vitamins is impressive. The main one, vitamin C, provides 19% of your daily recommended amount. They are also rich in potassium, antioxidants and fiber. Most peaches sold for eating are freestone peaches. That means that once the peach is cut, the pit comes out easily without clinging to the flesh. Simply take a knife and cut the peach along the seam all the way around. Then twist each half in opposite directions. The halves will come apart easily. I also don’t bother peeling my peaches for smoothies. Why waste all that goodness lying just under the skin. Chop peaches and remove stones. 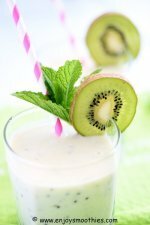 Add to blender, together with a frozen banana, coconut milk and vanilla yogurt. 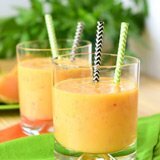 Blend together until your smoothie is smooth and frothy. Pour into two serving glasses, top with whipped cream and sprinkle over flaked almonds. Cut the peach in half and remove the stone. 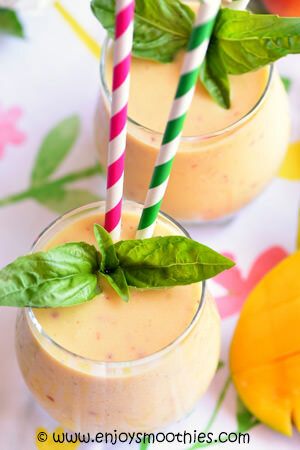 Add the two halves to your blender along with the frozen mango, banana, coconut milk and grated ginger. 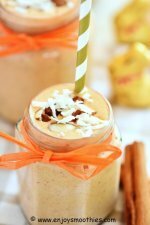 Add the peaches, banana, vanilla yogurt, almond milk, cinnamon and nutmeg to your blender and whizz on high until smooth and creamy. 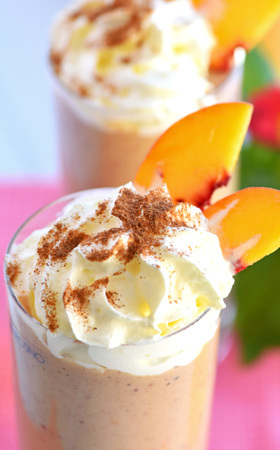 Pour into two glasses, swirl over some whipped cream and sprinkle with extra cinnamon.